Welcome to the islands of Saint Vincent and the Grenadines, the most beautiful beaches in the Caribbean. Saint Vincent and the Grenadines is an independent republic since the separation of Royaule Kingdom in 1969. The country has about 120 000 inhabitants, mainly on the main island of Saint Vincent. The other islands are smaller and farther south, are called The Grenadines . The geographical position of the Grenadines islands make them dream for tourism in a fragile eco-system. The tour operators often offer cruises in the area. Saint Vincent and the Grenadines is located in the southern Lesser Antilles, between Saint Lucia and Grenada north to south. 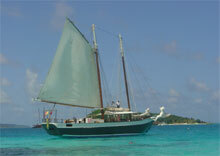 To visit the Grenadines, the boat is required! The country has no less than 600 islands and islets. Three have a small airport: Canouan Island (CIW IATA), St. Vincent's main island (code SVD) and Union Island (UNI code). The other main islands are Bequia Baliceaux, Mustique, Canouan, Mayreau, Tobago Cays and Petit Saint Vincent. In general you reach the islands via a stopover in St. Lucia or Grenada. The cruises usually depart from these nearby islands and through the Grenadines. Air Caribbean since you can make a Martinique roundtrip Fort-de-France - Union Island, off to go to St. Vincent, commuting by boat to Union and back. Or private plane to Union Islands , always the Martinique example. Saint Vincent and the Grenadines is the flag of convenience, which is the main resource of the country with tourism and banana cultivation. The country is very poor, if a problem does not seek treatment at the hospital site: repatriation to France or Fort St. Lucia more than recommended. Most small islands have no clean water and must rely on the sky even worse for electricity. The nights in a bungalow of your dreams are very expensive, even more than on an normal island : 500 €! Often on private islands or semi-private. You may know the famous Mosquito. >>By plane or boat Union Islands : go! Add to bookmark this page Saint Vincent & The Grenadines " The Grenadines " - Firefox do "Ctrl D"